Premium Clock includes a fantastic new visual style, nearly a fifty high quality skins, analog clock, digital clock, customized desktop, calendar, and more! A digital clock for windows like your own clock very clear and fine with green LEDs and it's resizeable the clock will be stretch automaticaly their digits. This is a screensaver that will take you away from your everyday trouble. You will be able to free your mind from all the burdens as you enter the charming world of the seaside. Any lighthouse has a million stories to tell and these are stories of courage and struggle. They are told by the murmur of the ocean, the cries of the seagulls and the songs of the wind. Listen to these soothing sounds and watch the eye-pleasing scenery! Forget about all you problems and dive into this world of relaxation and meditation. If you encounter any technical problems we’ll help you or give you a full refund. RISK FREE! 30-day money back guarantee! One day the Earth will become too small for the humans and they will start looking for a home on other planets in distant galaxies. They will embark on a journey never ventured before. They’ll get to the very center of the Universe discovering new bright stars and mysterious planets on their way. They will see huge space stations and magnificent battleships on a voyage to conquer new civilizations. Do you want to get there? With Star Wars 3D Screensaver your screen becomes a teleport gateway to that world. You will definitely appreciate the outstanding graphics and the enchanting space scenery with fascinating special effects. If you encounter any technical problems we’ll help you or give you a full refund. RISK FREE! 30-day money back guarantee! Do you want to see what’s inside the Matrix? Well, you don’t need to take the red pill and you’ll always be able to return. This brand new 3D Matrix Screensaver will take you there in no time. Your screen will become the gate to numerous worlds of the matrix. They will fly by and as you get closer you’ll be able to decipher the code and see what they are like! This brand new 3D screensaver will give you a chance to get an inside look at the way the Matrix works. You will find yourself in the long white corridor with multiple doors on either side all looking exactly the same. Behind these doors are various realizations of the Matrix. Some look very real, others contain errors, yet other ones are still being constructed by the Matrix. And just like the Matrix this corridor never ends. This screensaver looks like one of the products of the Matrix itself. You can hardly tell what’s real and what’s not. The Drunken Clock Screensaver protects your monitor by displaying an attractive analog clock that looks like you’re viewing it through water. Its numbers and hands float gently around the screen against a moving background as the “tick” of the second hand is heard. The program allows for background changes as well as other appearance and behavior options including support for “skins”. You can write your own text message which will run as a ticker. A synchronization function will set your PC clock to atomic time via the Internet. Just a few centuries ago the seas were ruled by bloodthirsty and greedy pirates. They not only robbed the civilian fleet but also battled each other for the stolen loot. A lot of their ships sank in the Caribbean and still remain their. In this screensaver we get an awesome opportunity to dive into the depths and take a closer look at one of these ships. We will get into the cabins and see the treasures which the pirates valued more than their own lives. We’ll also meet the new inhabitants of the ship and its surroundings on our way and enjoy the beauty and the quiet of the underwater world. Do you want to get there? With Space Flight 3D Screensaver your screen becomes a teleport gateway to that world. You will definitely appreciate the outstanding graphics and the enchanting space scenery with fascinating special effects. When you take a minute to get some rest your desktop will teleport you to a quiet bungalow far away on a desert tropical island. A cozy room with a hammock, the wind playing with the canopy door, a window overlooking the enchanting sunset over the ocean, a comfy arm-chair and a chilled drink. What else can one ask for? The beautiful large aquarium fits in perfectly in this serene environment. 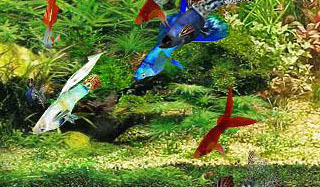 Elegant fish, swaying plants and rising bubbles… Absolutely unparalleled beauty! Complete with full stereo music, this screensaver is definitely the best for anyone looking to calm their nerves after or during a hard day at work. If you encounter any technical problems we’ll help you or give you a full refund. RISK FREE! Have you ever dreamed of getting a chance to see the rings of Saturn, the distant Pluto, the Asteroid Belt, Jupiter, Mars and of course the mother Earth from space? This screensaver is an outstanding 3D model of the solar system. Every planet is there along with its satellites and even a small info graph with basic facts. All the proportions and trajectories are right. You get to float through some of the best known constellations like the Big Dipper and get a great view of the Milky Way. It’s not only the sheer beauty but also the educational content that make Solar System 3D Screensaver an absolute must-have. This screensaver will immerse you into the peaceful environment of the forest life that will make you forget about all your problems! Allow yourself to experience the sense of calm serenity that comes from disconnecting from the feeling that you have to “do” something. Experience the serene atmosphere of a quiet winter night with this outstanding Winter 3D Screensaver. It will take you away to a peaceful setting with a few cottages covered with snow, with smoke coming out of chimneys and slowly rising as there is no wind to disturb anything in this quiet winter paradise. Relaxing music and high quality 3D graphics will help you forget about the busy world around. This terrific 3D screensaver will help you feel the magic of the Holiday Season. You will find yourself in a quiet winter forest with a few cottages scattered around. Everything is covered with snow and it seems like the nature is waiting for a miracle to happen. A huge Christmas tree in the middle of this peaceful setting, decorations on the houses and the outstanding background music add to this unique holiday mood. Santa is definitely paying a visit to this place! How about you? Do you want to see what goes on inside living cells? This is really something spectacular! Install Living Cell 3D screensaver and turn your desktop into the eye-piece of a powerful microscope. You will see how numerous particles move about performing their little but extremely important functions. The screensaver provides superb environment for getting acquainted with the challenging but extremely interesting content of cell biology. Space tourism is only available to exceptionally wealthy people. Among its primary attractions is the awesome and thrilling feeling of looking at the Earth from space described by all astronauts as extremely intense and mind-boggling. This screensaver provides a unique opportunity to do that without having to pay 20 million dollars. You will actually get to see more than a “regular” space tourist. It is a fantastically realistic 3D model that also has enchanting views of the Moon and well-known constellations like Orion and the Big Dipper. Great educational content! Find yourself in the King’s well-guarded treasure vault filled with gold, silver, jewelry and various artifacts. Be careful not to awaken the sleeping dragon though or you may join some of the brave treasure hunters whose bodies serve as a grave reminder of what greed leads to. This screensaver will turn your desktop into a secret teleport gateway to the most sacred place in the kingdom of far far away.